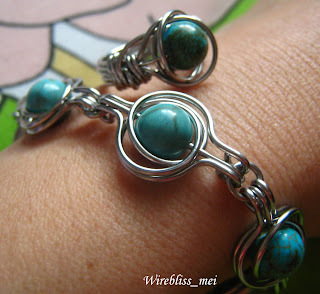 These pieces are the matching ring and earring for the turquoise bracelet i made yesterday. 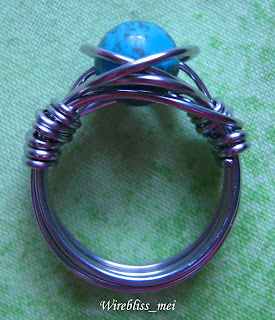 The ring was difficult due to the number of wires involved and its a bit bulky at the sides. 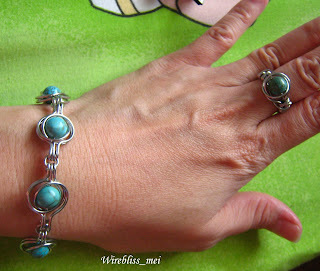 I have a set now,........emmmm, now should i make a matching necklace? Yes, definitely make the necklace! Beautiful stuff! Oh! oh! Now i am really tempted.....thanks Muddy. I'm curious... what don't you like about the ring? It's a little unusual, but a perfect match to the bracelet and earrings! Bravo! I am happy with the ring except for the wrap at both sides of the shank of the ring. They are too bulky/heavy looking. I would prefer a more slender look. 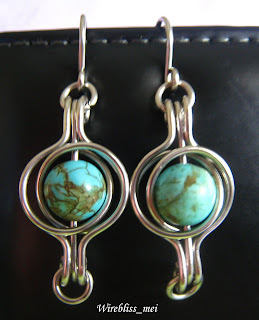 I was just thinking if you wanted a sleeker look why not go up one gauge on your wire for the necklace. Just a thought though. It is very beautiful work indeed. thank u for your comments anonymous. When u said go up one gauge, do u mean thicker wire or thinner wire as the no. increase, the wire is thinner. Sorry, a bit confuse here. I Love this piece! The bracelet is awesome. Thanks Talula....i am planning for a necklace at the mo.